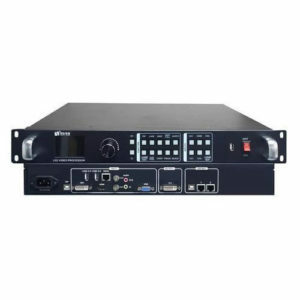 Hardware Videoinput DVIx2,HDMIx4,VGAx2,CVBSx2,DVI_Loopx1,USB/SDI(option) Videooutput DVIx2x2copy Audioinput HDMIx4,3.5mmaudiointerfacex6 Audiooutput 3.5mmaudiointerfacex1 PCcontrolinterfaceUSBx1,Rj45x1 USBupgrade USBx1 LCDscreen 2.8inchesfullcolorLCDx1 Key x24 Knob x1 Sendingcardslot x4 Features LS-VP4000U LED Video Processor has 11 channels of video input, 4 channels of video output 6 channels ofaudio input and 1 channelof audio output.It can be widely usedin engineering, rental performance, irregular/large LED display screen/mixed LED display (different spacing), large stagetheater,displayandexhibition,etc.5.3millionpixelssupportedMaximumsupports7920(H)*4000(W)pixels. 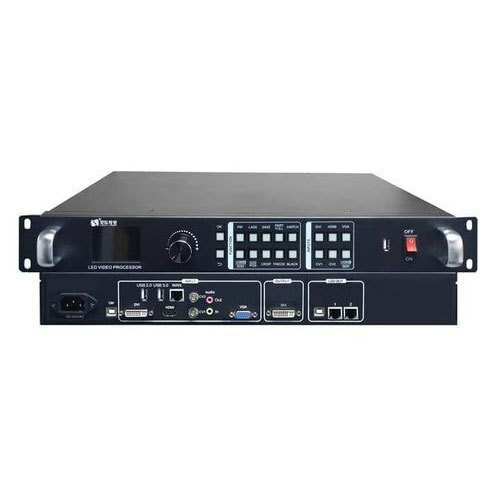 4 pictures output Display four different digit signals synchronously (DVI/HDMI/SDI) or four differentanalogsignals. Shortcut key setting One key setting for scanning the input signal automatically,one key setting forconfiguration ofled display; One key automatically set forsplicing(horizontal orvertical)evenLEDtwodifferentoutputresolution. Splicing Supports splicing by one or more than one video processors, and frame lock on or off forLED/LCDsplicing.TimedtaskSupport16displaytasks,timingswitchtodifferentscenesandtiming turnon/off. PresetstorageandrecallPreset10differenttemplatesandquicklyswitchviaonekey. 60 kinds of HD test patterns No need to connect with any signal, integrated with output 1080P HDtestpattern. Seamless switching/Fade-in-fade-out Seamless switch from one channel’s picture to another channel’spictureandwith fade-inandfade-outfunction. 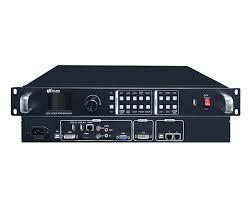 Customize inputand output resolutionAll DVI / HDMI /VGAinput and output resolution can becustomized. Chroma Key Dig out a part of the video image, and then superimposed on another video, for exampleimage overlapped. Audio and video synchronous Each video input matched with a separate physical audio input interface. BackgroundcolorsupportAdjustablebackgroundcolorwhichisusefulifsignalloss.